I love the City to Surf. Being a fun run, it is not only a lot of fun, but also a great leveler. Every year, I am overtaken by someone who has the look of someone I should be beating; and sometimes I even overtake a few who look like they ought to be beating me! I especially enjoy this aspect of fun runs: they remind me that there is more to everyone than the things I can see. For a few reasons, this year’s event was special to me; and as I have a bit of time, and the inclination to try some new tricks, I figured that I would post a few charts. First up, here is a point-chart of times by finishing position. Note how the staggered starting waves create tide lines in the finishing times and ranks — there are clearly some fast runners in the back of the pack, and some slow ones in the front groups. The grey points are net-time (from your bib-tag), and the red line at the top is gross time (time on the official clock). 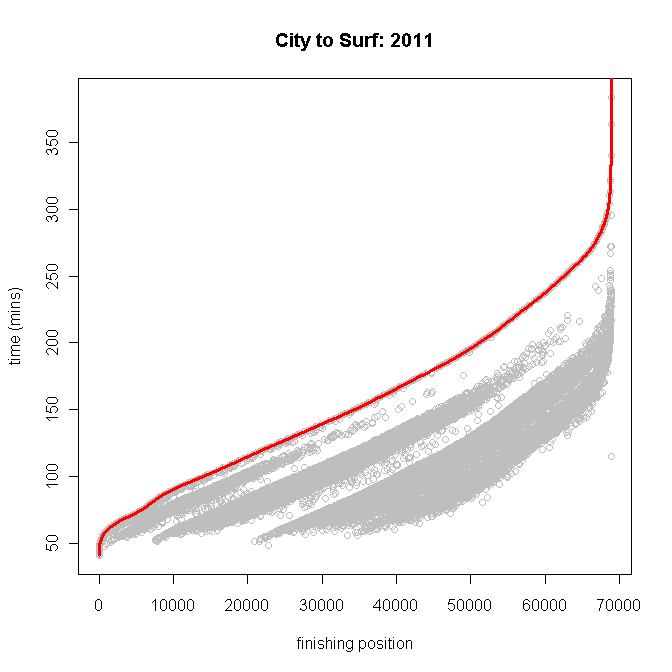 Thus, if you finished (say) 30,000th your personal time is a grey point (at 1hr 13m 04s), and the official city-to-surf clock read 2hr 19m 27s when you crossed the line. Men are pretty competitive from 16 to 39, but after that we tend to slow up a little. The fastest runner this year was the 20-29 division, however the 30-39 group outperforms on average. 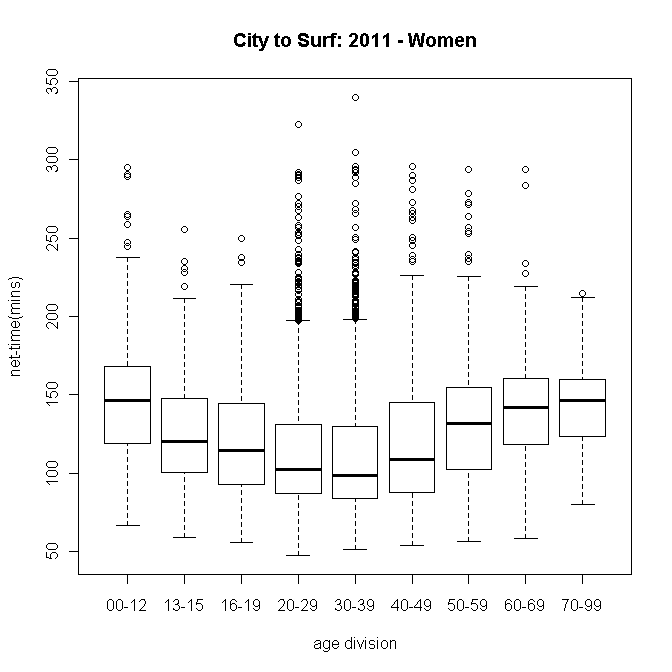 I am surprised to see how much variation there is in Women’s results. Performance improves markedly as women move into the 20-29 division, is steady in the 30-39 division and then falls away similarly sharply thereafter. As in the male case, the fastest women was in the 20-29 division, and the fastest group was the 30-39 division. How did I do? I ran 70m 01s, which was 1s over my target, and 24s shy of the cut-off for the top quartiile of my division (M30-39 Q1 69m 37s, median 79m 35s). Next year I aim to run sub-60. 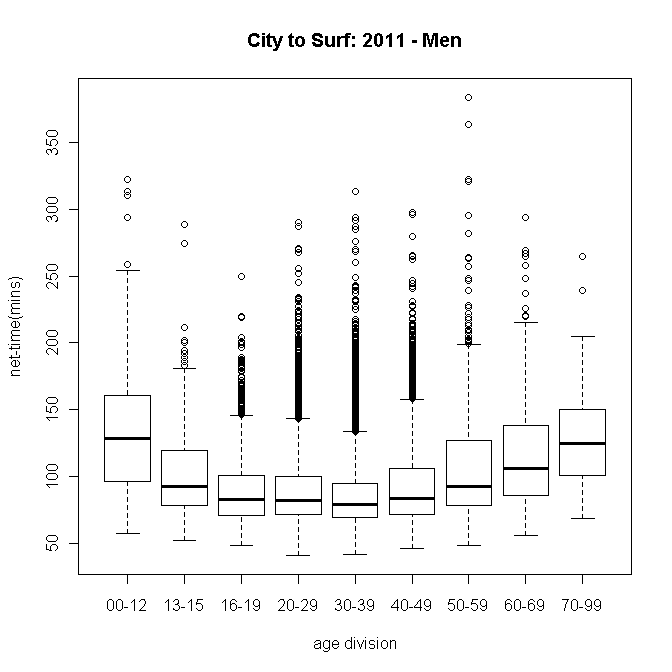 I scraped the data from the city-to-surf website using the below Python script. This is my first attempt at Python code, so please comment with suggested improvements. There are two bugs in the code of which I am aware — please help me fix them? First, when a name string has unusual characters (Scandinavian names, for example) it crashes. Second, when there are missing strings (division was sometimes missing – I suppose some folks like to conceal their age) there is no ‘a’ tag, and so the parsing gets all mixed up, which eventually causes a crash when the for loop tries to ref a string that doesn’t exist on the page. 1. It’s most probably due to character-encoding mismatch between the page and BeautifulSoup, do you have an example of a result page where that is happening? 2. Your code assumes that all tags always happen, but you’ll need to check the size of the returned tags and div_tags to avoid pointing to non existing tags.